Saturday, August 19 - "NA NA LAND"
Thanks to Meg for writing today's post! What an amazing play performance we had! All that practice we had all week and all day today paid off! Everyone did a wonderful job. We loved getting dressed in the dressing room and having our makeup put on. That made it feel like a real performance! A big thank you to everyone who made it all possible, especially the Theatre Workshop of Nantucket, and thanks to our friends and family and the majority of the Mama Mia cast who came to watch us! We would also like to thank Gillian (the founder and former camp director) for coming. It meant a lot to us! Gillian and our friends will always be a part of the Tulgey Wood community. We all had a lot of fun and we hope to keep a new tradition going of performing in a theater every year. Thanks to Gary Langley, we have tons of pictures to share here -- and hopefully, we'll soon have a link up to the play itself! After the play, our supporters joined us for light refreshments and congratulated us on our performance and had a group photo of us taken in front of the theater. Then a group of us went to pick up the yummy pizza for dinner which was a big hit! Thanks so much to Maria of Pi Pizza who donated them. After dinner, we proceeded outside for a camp fire and had s'mores and sang along to songs. It was a lot of fun but people retired early to bed as it had been a very long day filled with excitement! Tomorrow is our last full day of camp and we can't wait to find out what is in store for us! Sunday, August 20 - Last full day of camp! Once again, thanks to Meg for today's blog post! The morning of our last full day of camp, we woke up to the aroma of freshly baked bagels for breakfast (thanks, Harry!!!) and then we cleaned up the house to make it easier to close up camp after many of us leave on the ferry back tomorrow morning. After cleaning, we set out on a scavenger hunt, starting and ending at Children's Beach. We walked around town to find as many clues as we could from a long list: we had to take pictures or video record them to prove we had found them. We had an hour and a half to do as many as possible. Some of clues were: find someone wearing Nantucket reds; find someone wearing white pants with a red belt, which it turns out no one does! ; ask a stranger to marry you; ask someone to pronounce Tulgey Wood; find a store with some merchandise you can hold priced over $5,000; board a boat . . . The teams all named themselves. 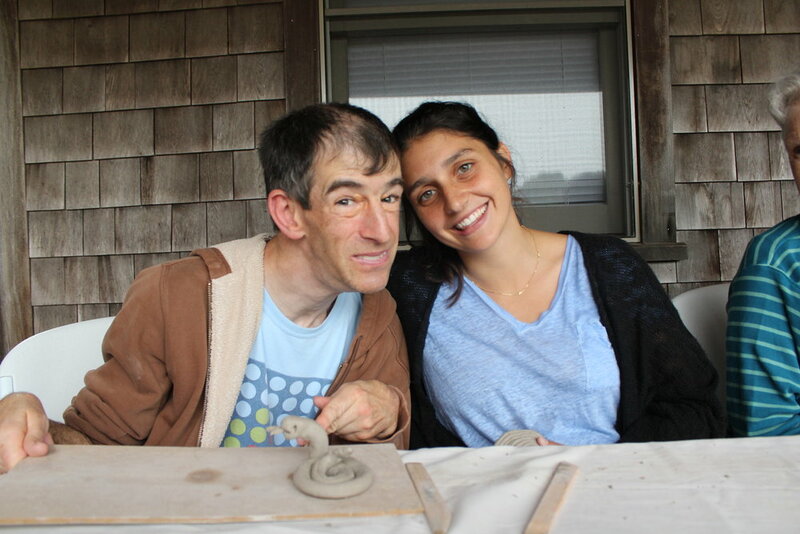 When Team "Kieran's Whalers," which included Meg, asked a stranger to insult Martha's Vineyard (another item on the scavenger hunt list,)the woman said, "God created Martha's Vineyard, but lives on Nantucket." Steve got married to a stranger and Cameron wore two eye patches! Kieran's Whalers had a little adventure getting Cameron, Steve and Meg onto a boat (one of the harder challenges on the hunt!) because there was a big gap between the dock and the boat. They got on the boat in one minute and 30 seconds! What a record! The man who allowed them to get on his boat gave us a $40 dollar donation, which was so nice! Then, when that team was heading back to Children's Beach, Sean was giving Steve a piggy back ride and he fell backwards and scrapped his knee and back, so Mike L. got a taxi cab and spent $18 of the $40 donation. Man, a taxi is expensive on Nantucket! The good news is the team made back just in time for the hunt deadline. Every team had adventures to share. Team "Shabooya Ole Fahts" was pretty tired after a lot of walking on uneven cobblestones in the sun and had just decided to take a break and drink some iced tea, even if it meant being late for the finish line, when a gentleman sat next to Rebecca and asked what they were doing. Rachel said they were doing a scavenger hunt and mentioned that they still needed to propose marriage to a stranger. He was instantly game, and when Rebecca asked him to marry her, he answered earnestly, "I know we've just met but I'm already in love with you! Of course I'll marry you!" Then he kissed her on the cheek. That gave their team the energy they needed to rally and hurry back to Children's Beach just in time for the deadline. Team "Winfographics" took some excellent video of Peter's chair bumping over the cobblestones, which Peter thought might make him sick to his stomach, and found a ship model made of whale bone and priced at $60,000. It was behind glass, making it hard to hold in hand and therefore questionable whether or not it counted toward the challenge, but it was a great find! Team "Yogis," the eventual winners, as it turned out, accomplished many items on the list. Candy cut right to the chase when it came to the proposal, just saying to the young man (who also had a beard, so that took care of an additional challenge item) the team hailed from across the street, "Marriage?" And without skipping a beat, he answered, "Marriage? Yes!" They were the only other team to board a boat, and their boat of choice had a ramp, so that made it a pretty manageable option. The team asked many of the people wearing white pants if they happened to also be wearing a red belt, but none were. With the hope of winning high in his mind, Harry finally bought a red belt and the team was easily able to coax a passerby to put it on and have her picture taken. Every team had a great time and did a great job! What a fun way to meet new people on Nantucket. As someone said afterwords, if you tell someone you're doing a scavenger hunt, they'll do just about anything to help you! Thank you Harry for coming up with this idea and Jamie for making it work so well! After the scavenger hunt, we had lunch made for us by the Hungry Minnow restaurant on Children's Beach, which was very generous! The owner, Rebecca, had met us at the Whaling Museum last year and kindly offered to give us lunch at the beach this year. Quesadillas, hot dogs, chips and popcorn made a fun meal before we took a swim or went back to camp to rest. We were all entertained by a folk band after we returned from the beach and then watched a video of our play performance. It was fun to watch! Then we had a Mexican casserole for dinner and ice cream for desert and said our good byes and how much we loved camp! This is a piece of those goodbyes. Candy loved the boat ride and the play. Jamie loved watching Peggy and Grace interact with each other. Grace loved the s'mores and the beach and the food. Olivia was very appreciative of being a part of Tulgey Wood. Cameron indicated that he loved hanging out with Sean and got Sean to sing and dance to a Taylor Swift song. Peter was proud to learn his lines for the play and loved the scavenger hunt. Will said he'd learned a lot about kindness, patience and friendship from Peter. Rebecca said, "I would like to thank all my friends that made my summer special for me!" Ellen sang "My Bonnie Lies Over the Ocean." Mike L. said that one sign of a really amazing camp is when cleaning the dishes makes him want to cry. Monik loved the music and doing the play and getting to know everyone at camp. Steve said, "When I found out that Gillian wouldn't be here anymore, I had second thoughts about coming, but I found out that you had it in you to make a great camp." Katie said, "I love this camp. I want to come back next year. I like the Boston Pops Concert and the boat ride. I'll miss Jamie. She's become a good friend to me." Ben said, "I loved that I got to spend time with this incredible man (Bobby). He has so much joy and humor in every moment in his life!" Sean said, "From the first day I met Jack, he showed me so much love, because he knew my dad and my brother already. Now I've gotten to know Cameron and I look forward to having a long relationship with him, too!" Jack said, "This is a good team and I hope to see you all next year!" Carley said, "All of you have a way of helping me open my heart more than I thought was possible. I'm grateful to be a party of this community!" Francis said, "The community of acceptance has been important to me as a new person. I've learned a lot from the things I've done her, whether they came out right or wrong, and it is helping me be a better person." Eleanor said it was a good summer, and she is so proud of all of us. We were all sad but can't wait again for next year!" Nobody's favorite day. . .
We love you! Hope to see and hear from you all soon! Thursday, August 17 Thanks to Mara for writing the Museum portion of our blog today! We had a blast at the Whaling Museum today! Our good friend Susan (who led our sing-along on Tuesday eve) treated the entire group to a private tour and exploration of artifacts. We learned the origins of "Thar she blows" and the intricate details of the whale hunt. We then broke into two groups. One group went on a guided tour of the museum and the other group got to touch and learn about many things including a whale tooth, spears and whale bones! On the guided tour Adama was particularly excited to learn about the healing powers of whale oil of which the museum has in large glass bottles on display...this of course is no longer used due to the importance of not harming or killing whales in this day and age. We also learned about the bonds that the whalers made with the people living in the Pacific Islands and how they would often-times come back with tattoos given to them by the islanders. We wrapped up the tour by having fun in the photo booth where we able to choose our backgrounds and imagine ourselves in whaling times. We are very thankful to the whaling museum for providing such a interactive experience!! Peter spoke about the trip after dinner. He said, "I've been there many a time and I love it. We talked about the harpoon and I touched one. It was big and pointy. We also talked about scrimshaw and blubber perfume. It smelled okay." After the trip to the museum, we had a full run-through of the play at the theater. Thank you to the Theatre Workshop of Nantucket and Sarah for opening the stage up to us today and tomorrow! It was really different to work in that space - there were several curtained exit doors and an actual backstage, so we had to learn where and when to enter and exit. Mike L., Monik, Rachel and Nat G. are collaborating so wonderfully to create, revise, choreograph, figure out lighting cues -- it's a huge leap from the back portion of the living room! After the whaling museum, while we ate lunch, the people who set up the Boston Pops concert came by and gave us Boston Pops t-shirts. Everyone was excited about that since we all love the Pops! We would like to shout out a big thank you! Later in the afternoon, a small group of us went on the last boat ride and the rest of the group one group went to enjoy the beach and the waves at Madaket Beach. It was a gorgeous sunny day to do both activities. The boat ride was thrilling because there were a lot of waves and it felt like we were on a roller coaster ride. We also got a chance to see the boats at the dock being fork lifted up into their holding station. You don't get to see that every day. The boating group joined up with the rest of the group at the beach. It fun day at the beach also because there were a lot of waves, and it may be extra good luck that we were there that day. You'll see why! Harry was standing next to Sarah and life-guarding us and he noticed that some kid, not part of our group, was struggling in the waves. He started to go over and see if his help was needed, when a man went rushing past him, leapt into the water, and scooped the kid from the water. Harry was sure it was the kid's dad, but that man was Kieran! Yay Kieran! Harry went back to Sarah, who was up to her knees in wavy water, and was getting pulled in. Harry held her hands and started pulling her back when suddenly Kieran leapt from behind and lifted her up! Next thing you know, we'll have to get him a mask and a cape! One group took a sidetrip on the way back from the beach to hand out fliers. In some locations, people were very open to taking a flier and discussing the upcoming play, but in town, people were less interested. Peter and Steve started feeling a little sad that we weren't able to spread the word as much as we would have liked, but then Steve stuck a flyer out the window up and lightened the mood with, "Hey Mr. Stop Sign! Do you want a flyer to our play?" Dinner was a special affair. We had a barbecue cookout with a few island friends and jammed to some music. We had quite a few guests, and some guest grill masters . It was so nice to share a meal and to share our story telling tradition. Thanks for the yummy food and great company! After dinner we had a very productive play practice, but everyone couldn't wait to go to bed after a long day. We have to get rested up for another big day of rehearsal. We have Meg to thank for most of today's blog as well! The day started with a quick but delicious breakfast of eggs and veggies and an even quicker clean up so we could run through the show a couple of times at the theater. We came back for lunch and rest and then went in many different directions. Some of us stayed here to work on props for the play. Some people did print making with Eleanor. And some went into town to have ice cream and hand out the remaining fliers about our play. Some people said that they already heard about it and said they are coming! We had such a successful final dress rehearsal the night before the play. Everyone worked so well and did their best and had fun! We are so excited about performing in an actual live theatre! In years past, we performed at the house we stay at (the big wedding house) on Nantucket so it's going to be a nice change to be in a theatre. 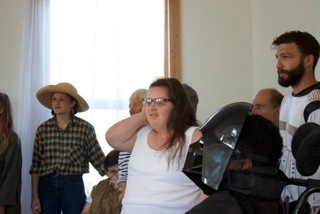 Thanks to the people at the Theatre Workshop of Nantucket who made this dream come true! Performing in a theater makes acting in a play seem more like a real performance! We hope to see you there! We have a real treat in in store for you! Today's and Tomorrow's Blogger is Meg! We had a quiet and relaxing start to our fifth day of camp. It's always a great way to begin with yoga from being stiff when we first get up. Yoga is also a great way to clear our minds of clouded thoughts and getting focused for the day. 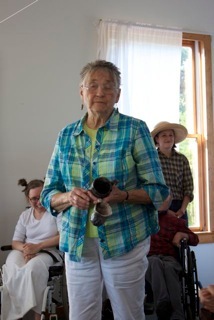 Some of us did pottery and two small groups went for boat rides. Later this evening, we are gearing up for a fun sing-along and a picnic at one of the local churches on beautiful Nantucket. Hopefully the rain will stop. We haven't had the greatest weather since we've arrived, but that doesn't stop us from having fun! We just love being able to get away and get together with our friends. The sing-a-long at the Siasconset Union Chapel was a a smashing hit. Some of the songs we sang were: "This Land is Your Land", "Blow the Man Down", "Take Me Home" by John Denver, "You Make My Dreams come True" by Hall & Oates. The crowd seemed to enjoy themselves have a good time but they seemed to really get into the Hall and Oates song which is a sneak peek of our play. Meg loved the song, "My Voice Matters". She loved the song because it gives a powerful message that every person counts in this world and we all have something great and special to offer that we can all benefit and learn from. After the sing-a-long, the Tulgey Wood gang had their picture taken and had a scrumptious dinner at the casino down the street, provided by the incredibly generous church congregation. Thank you so much for having us for dinner and for sharing our meal time/story time tradition! And thank you to Deb and Gary for photographing the event! After we got back from dinner, we all had a successful night of play practice! Everyone has a lot of rehearsing to do.The play is going to be great! Then off to bed we went, definitely excited knowing we are going to the musical "Mama Mia" tomorrow night! We had an energetic morning filled with music and practice for the play and a drumming circle with our friend Gary. From the sound of it, we could have a lot more sessions. The drumming sounded wonderful and nobody missed a beat! Besides yoga, music is also a great way to relax and get focused for the day. It helps us get into a great mood and be in a happy state of mind. After an early lunch, we did a run through of the play and everyone did a great job! It's okay if people make mistakes with their lines or singing. What's most important is to feel good and proud of yourself about being part of a production and having fun! Then we had a much needed nap after doing such a great job with rehearsal. And I'm excited to report that we have an extended relaxation period with more yoga. Yoga is very relaxing with breathing, stretching and meditation exercises. People should definitely try yoga if they haven't tried it already. After yoga we had a early dinner to see the popular musical hit of Mama Mia which we all been very excited to see! The musical Mama Mia was a smashing hit at Bennett Hall tonight! Katie, Grace and Meg knew all the songs and were singing along and dancing to every song. Candy and Jackie were also dancing along and cheering in the front row. The actress who played the mother played the mother on Broadway. Some of us have seen it already on Broadway, but loved it just as much! Everyone had a great time! Meg loved sitting literally two inches from the stage and seeing the guys up close in their swim suits! The entire play was fun to watch! Bobby and Adama were enthusiastic throughout as well and sang heartily for the final three songs. 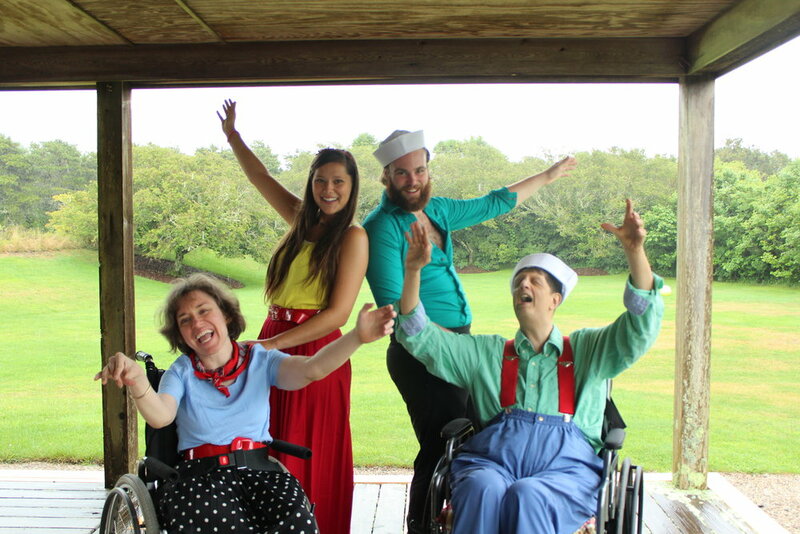 A big thank you goes out to the folks at Theatre Workshop of Nantucket who donated the tickets for us. We are extremely thankful and lucky to have seen this production. Rachel asked Rebecca, "How did you like the play?" Rebecca answered, "It's great! Ours is better!" Peter told an actress that he loved her performance, and that she was the best in the show. He asked her for a signed photograph of herself. She was pleased and said, "Yes, of course, no one ever asked for one before!" As we we were waiting to get loaded back into the cars to head back to camp, the cast mentioned to us that they will be coming to our play on Saturday. That would be incredible for them come because we love anybody who wants to support Tulgey Wood! We printed really cool postcards to help publicize our play. Many people looked at the final version before printing it 250 times. When Steve helped Mike pick them up, he glanced at them and asked, "What's April 19th?" Yikes! It was supposed to say August, not April! Steve was amazed. "I can't believe I caught that! I can't even read!" Now off to bed getting rested up for the Whaling Museum and another big day of play rehearsal tomorrow! Sunday - August 13 After a huge feast for breakfast, we split into three groups of about 12 people each and had a wonderful time at three different churches. This was a new way to approach Sunday morning, and we loved it, despite the logistical challenge of getting around without a big van! Then it was off to the beach for a surprisingly sunny and blue-skied day of swimming, relaxing and biking with the Wheelers, thanks to Joan, Darcy and their crew! All who wanted to take a ride on the Wheeler did (almost everyone did); all who wanted to swim did (almost everyone did! ); all who wanted to soak up sunshine did -- does it get any better than that? To help out with the Wheelers, it was suggested that we bring a couple of bicycles with us so one person could ride in front and stop traffic and one person could ride in the back to make sure there are no stragglers. We called the Nantucket Bike Shop, a bike rental shop, and asked to borrow two bicycles. They were wonderfully accommodating and loaned us the bikes, no paperwork, no deposit. Happily, we used the bikes and returned them with ease, but unhappily, we also returned one of Darcy's bikes. We have yet to track it down! Big Oops!! Thank you, Darcy, for being so understanding about it! After dinner, we heard wonderful stories from Scoobs about an elephant who surprised her in the bathroom in the middle of the night; Joan, who told about meeting Jacques; Francis, who told about swimming with sperm whales; the Siasconset Chapel group about how welcoming the service and community was there and Grace and Mike did a beautiful waltz-style dance to "Dancing Queen." Since we are creating a play loosely based on "La La Land," we decided to watch the movie. The computer rebelled when asked to play it, so we entertained ourselves with a Tiny Talent Show. Among many other sharings, Carley made squeaky toy noises every time she squeezed Sarah., Adama sang "Shabooya," Bobby did an amazing interpretive dance without musical accompaniment, Mike and Andrew sang a song from their band, "Baeja Vu," Rebecca narrated a fictitious fight scene between Mike L and Gabe, and Carley sang a jazz tune while Andrew played piano. The collective talent in this group is impressive, to say the least. We paused the movie at the (spoiler alert) first kiss, and happily went to bed. Do you know any sea shanties? After a wonderful music class, most of us now know "Blow ye winds in the morning, blow ye winds hi ho . . . " and I must say, we sound hearty enough to raise the anchor and set sail on an old time vessel. Thanks to Chris Shannon of Madaket Marine, two groups have already had a chance to feel the wind in their faces and the slap of the waves against the boat. Kieran, Ellen, Peggy, Meg, Rebecca and Carley took their boating excursion before lunch, and Mike L, Steve, Monik, Grace, Adama and Olivia went after lunch/rest time. Both groups reported having a great time, and enjoying seeing many seabirds, but no seals. Snapshots from boating this afternoon: Grace graced us with some whale calls, both of grown up and baby whales. Steve drove the boat some of the time, and tried to convince us when he got back that he crashed the boat. That group hoped to see the rest of us at Jetties Beach, so they rode over their and screamed and yelled at the people on the beach, only to finally realize our group was at a different beach! It was a cooler, cloudier day at the beach. The water was either freezing or refreshing, depending on your point of view. Everyone played or swam in their own way. Jackie floated in the floating wheel chair. Bobby and Ben stuck together. Katie demonstrated her strong butterfly stroke and Billy showed his flutter kick. Andrew said, "Water is a great equalizer. There are lots of people without disabilities who can't swim at all, and people with disabilities who can. Water is a buoyant force so people can stand on their own two feet." 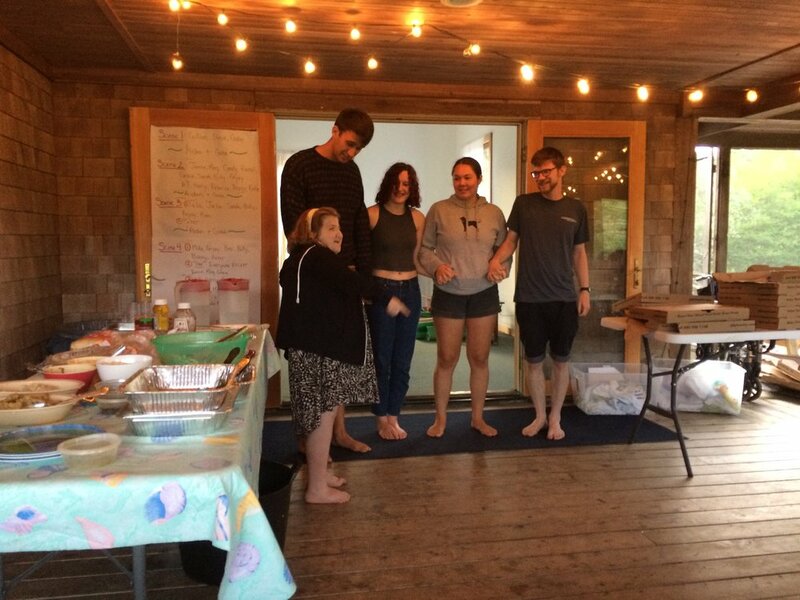 When we returned to camp, one group worked on a scene in the play and Marjorie led a yoga class before dinner. In yoga we worked on our partner poses and resident yogi Billy Collopy gave a standout performance, mastering the Ardha Chandrasana pose. Ellen loved the partner stretches, holding hands with a partner to pull back and forth and she also held her body in a beautiful tree shape. We closed our session with chanting and discussing "Om" and "Shanti" and felt one with our mind, bodies, and spirits before having dinner with some guests of our dear friend Susan Berman. After our wonderful dinner and yummy desert, Susan led us in a sing-along as the fogs rolled in. She is a wonderful singer and song leader, and we had a great time with her and her family. We had just enough time to finish watching "La La Land" before bed. So much happens here all throughout the day. Images abound while falling asleep . . .
Friday, August 11 - The start of camp is always one of the best days of the whole year, and this was no exception. The hugs, the shouts of greeting and excitement, the feeling of coming home, even if it's to a home we'll only share for 11 days, could power a trip to the moon, if it worked that way. 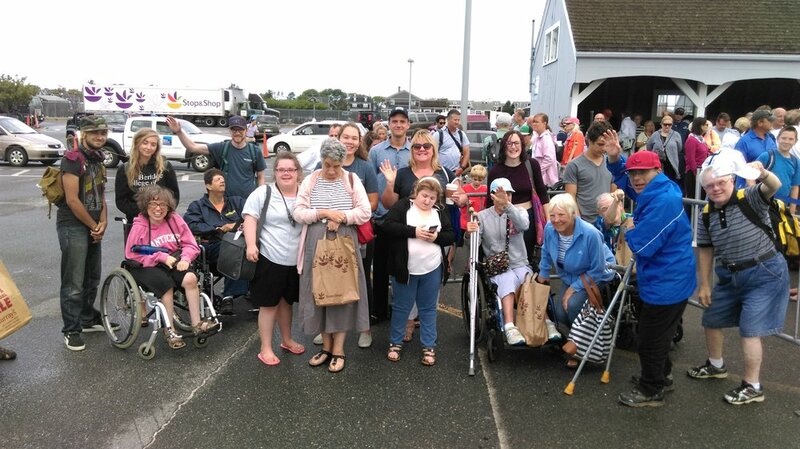 Most of the group came by boat from Hyannis, and we thank the Steamship Authority for their generous donation of passenger tickets on the fast ferry. We also thank the friends and families who helped everyone pack and travel. It's a big undertaking and we are grateful for the effort made by so many. We were delighted to see old friends Meg, Katie, Peter, Sara, Candy, Rebecca, Steve, Bobby, Grace, Billy, Peggy, Ellen, Cameron and Jack together again, back at Whereowhero Lane, and were especially glad that Bobby could make the trip, as he has recently been ill with pneumonia. We were also delighted that new friends Olivia and Adama have joined us! After a bit of unpacking and settling in, camp got underway fittingly with a yoga class with Marjorie. We "ohmed" and breathed and worked out kinks while our guest chefs, Kathleen and Blake made a feast for our first night's dinner. After a truly delicious dinner, including a many-berried cobbler for Sean's 21st birthday, we heard stories from all who wanted to share. There were funny stories, such as Sage's story of falling out of bed, and Kellen's story of a cabin inspection that didn't go too well; warm stories, such as Jack's story of reuniting with Sean and Mike's dad Brian after 25 years, and gross stories, such as Giulia's story of vomit on a ride at an amusement park. Our ambassador, Steve, a natural comedian, started his story about meeting Bernie Sanders while dressed up as Bernie by saying, "Most of you don't know I go to Zeno Mountain Farm," to which Mike responded, "Actually, most of us do know!" Some singing in the living room rounded off the evening before it was time for bed, and a wonderful first day of camp came to a close. It was not obvious that we would make it to the Pops Concert this year. Several snafus had already made it a "yes" "no" "yes" "no" event on our calendar, but thanks to the Nantucket Cottage Hospital Foundation, we woke up knowing it was a "yes" -- only to see that pouring rain was both in the forecast and outside our windows. Maybe it would clear up? While watching the rain fall and wondering about the evening event, we were very busy all day long. After lunch and rest, we worked on some scenes from the play. Scene 1 now has lines! Just in time, the weather cleared up, and the Pops concert was a "yes" again. Dressed for success at the concert scene, we loaded into every vehicle in the driveway. Sidenote about vehicles: Our Tulgey van may have made its last journey. Erik Evans at Don Allen Ford had been keeping a good eye on the van, and had checked it out and maintained it in the spring, but the Steering Box Gods are a mischievous bunch, and on Wednesday, the truck didn't pass Erik's inspection. He is, as I write, working like crazy to find a van we can safely use as soon as possible, so at this moment, we can't all fit into the vehicles we brought to camp. I have a feeling we'll be rolling by Monday! Thank you Erik for all you've been doing!! Getting to the concert was a story in itself, but for now, it's enough to say that Mike performed magic to get us around, under and through road blocks galore, and by the time the notes of "Star Wars" and "Harry Potter" blared joyfully from the stage, we were all in comfortable seats with picnic dinners and a perfect view of the goings on both on stage and at the catered tables in the center. We thank the folks of the Hospital Foundation and all the officers who helped navigate us through a sea of 8000 people in one tiny parking lot. The' concert was fabulous! After the John Williams pieces, the Beach Boys serenaded the audience with familiar and danceable tunes. We all loved it! Meg danced in her chair, Peter and Candy conducted with their light up sticks, Grace's glee was contagious, Adama and Grace and Katie and even Bobby, who we thought might have wanted a little rest after a busy day, got up to dance. Bedtime was late and welcome and thus ended a glorious Day 2 of the Fellowship of the Tulgey Wood. With our first ten years behind us, we want to thank Nantucket for all you've done for us! We couldn't have done it without the friendship, help, love, loans, donations and gifts of so many people and businesses. We know our list could never be complete for ten years worth of thanks, so we say a loud and general thank you to the many people who have helped us over all the years, and offer some more specific thank yous to at least some of the folks who made Summer 2016 not only possible, but wonderful! (Please accept our apologies if we leave you off the list!) Giant thanks to the Steamship Authority, who were enormously generous with passenger tickets on the fast ferry to get us all to and from the island at the start and end of camp! Giant thanks also to the Hyline, who were also quite generous with tickets for those of us who needed to travel between Martha's Vineyard and Nantucket. Giant thanks to our volunteer and always available, helpful and cheerful nurses, Gloria Gasnarez and Jenny Boley! Giant thanks to Erik Evens and Billy Tornovish at Don Allen Ford for the loan of a truck to help us make it to the beach with all our gear! Likewise, giant thanks to Amy Manning for the loan of a truck to help us make it to the beach, etc.! Giant thanks to the Nantucket Whaling Museum, and especially to Susan Berman and Karen MacNab for tours, sing-alongs and storytelling! Giant thanks to our yoga teachers, Marjory Trott, Sally Charpie and Sheri Perelman, who brought peace and beauty to yoga classes, whether before breakfast or before dinner! We offer giant thanks to Darcy Creech, who designed and donated 2016 Tulgey Wood t-shirts for all of us and many of our friends! Giant thanks to the community of the Unitarian Meeting House, and especially to Linda Simmons and Gary Langley for all they did to embrace and help us, including allowing us the use of the main hall for our concert! Giant thanks to David Crohan (and his dog, Walker) who traveled to Nantucket and played a beautiful benefit concert for us! Giant thanks to our friend Bob Lehman for singing at the benefit concert, and for hanging and singing with us throughout camp! Giant thanks to our new friends at the Union Chapel in Siasconset! 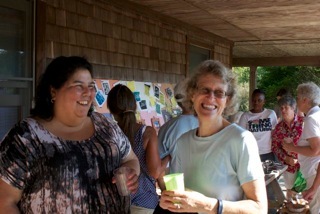 Elizabeth Queally organized a memorable and lovely cookout and long term support that astounds us! Giant thanks to Chris Shannon from Madaket Marine, who took us out on wonderful boat outings! Giant thanks to Maria Costanza at Pi Pizza for two amazing and delicious multi-course meals for all of us! Giant thanks to the folks at Something Natural, who willingly set aside plenty of yummy bread for us to use for sandwiches! Giant thanks to Kathleen Sanderson for organizing and cooking a delicious dinner for all of us! A giant thank you to Linda Williams who organized our tickets to the Boston Pops for the past two years - - already a favorite activity for the group! Giant thanks to Dan Bartlett of Bartlett Farms for our shopping discount on their farm-grown produce and for giving us space to store our van out of the weather over the winter! A giant thank you to Ed at Nantucket Emissions, who generously examined our van and helped it make it through one more summer. Giant thanks to Dave Renner who brings us wood every year for our pit firing of our pottery! Giant thanks to Susan Grey for supplying enthusiasm, costumes and a beach wheelchair! Giant thanks to the Highway Department for beach wheelchairs, which make all the difference when it comes to getting some of us over the sand and to the water! Giant thanks to the Lighthouse School for the loan of all of our chairs and tables this year! We give giant thanks to Francis Dorris for her recruitment help this year! We also heartily thank our kitchen cabinet, a group of talented and dedicated folk who help us all year long in creative planning and organizing. The group includes Jack and Mary Beth Weinhold, who also design and photograph for our brochure and publicity, Jacques and Joan Zimicki who are also our landlords and who help us with reduced rent and loads of energy and connections, and Peter Boynton, without whom we certainly wouldn't have found a way to continue camp for ten years and whose ways of helping have been too numerous to list! 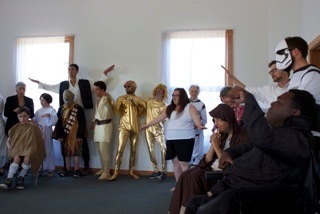 For your entertainment, while you're waiting for the much-anticipated, soon-to-be-available link to the play from 2016, we offer this link to the filmed version of our play from 2015 - our musical version of Ghostbusters! Enjoy! Remember the Whaling Museum? Here are some (belated) photos from outside there. Jack Weinhold nicely came down the street first thing this morning to take our group photo. The lawn was too sunny for the light to be right, so we posed on the front porch. We are excited to see what he captured! We had time to almost complete the Callopy Cup - - Bob played against himself, with great results! We had a good long beach trip to Jetties Beach, including delicious sandwiches that we brought with us. Meg and AJ went for a beachside luncheon at the restaurant there. It was very relaxing and in many ways, just the right beach for us. It's definitely the most accessible of the beaches we went to this year. Carley led an incredible yoga class this afternoon before dinner and then we stuffed ourselves on the best pizzas on Nantucket, generously donated by Pi Pizzeria. After dinner, we said our good-byes. As is our tradition, each person gets time to come to the front of the dining porch and tell us what they loved about camp. Peanut said goodbye first. "Okay, class, tonight we'll go to sleep and tomorrow we'll go home." Then she invited some friends to come up to the front with her. She told them she loves them and they had a big group hug. She made several other announcements during the evening to tell us that she loves us and will miss us and looks forward to camp this year. Aiden said that tomorrow we'd eat breakfast, pack up a big backpack, say goodbye to friends and go home. For his first announcement, he said, "I'll go back to Boston and never be seen at camp again." We all cheered when later, he changed that to, "I'll see you next time!" Bob Lehman stopped by to say good-bye. He said the concert was great and the play was fabulous and he looks forward to seeing us all next year. Peter told us that he loved being here this year, that he tried his best, and that he had a great time. 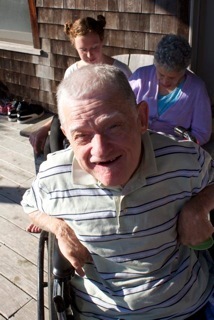 He loved being on the beach, loved the two trips to the museum, survived tipping over into the water in his wheelchair, loves us all and wants to come back next year. Peggy said, "I'm going to miss you all. I hope to see you soon! I'll keep in touch with emails." Steve, our ambassador, thanked Mike for being a good camp director and Peter for being a good roommate. Then he promised to be on time to camp next year. Will found it tough to arrive at camp just as we leapt into play mode, but was very appreciative of all the people who jumped in to help him out when he was stressed or overwhelmed. He looks forward to bringing all this greatness into the rest of the year and hopes to come on time to camp next year! Ben said, "This was my first year. Going into it, I didn't think I could handle it, but I'm glad I got to try. I'm grateful to all of you for making these three weeks so amazing." Meg said, "It's really hard for me because this is the best part of the year for me. I have friends at home, but they don't feel like true friends. You're like my family and I thank you!" Carley said, "I'm so happy I ended up at camp. I never want to leave. I love what I've been doing here. I haven't had an artistic project to work on in years. I love that we've been doing yoga and music every day. I feel on fire here, so happy to share all these special passions with everyone here. Thank you! Thank you! Thank you!" Grace said she had fun at camp. She said the best part was the s'mores. She also liked kickball and would like to come back next year. Katie said she had a great time at camp and she'll miss all her friends. She will miss Peter's God Bless America. She liked the concert, the play and the beach, and she appreciated the food here. She also wrote, and asked me to add, "My fav parts of the camp this year was having the cookout yesterday, having rest time, spending time with friends. One memorable thing is the concert and the play." AJ said he hoped to be cool and start with a quote from his lines in the play, but really, he just wanted to say that he loved camp, even (especially) the people who teased him. He feels lucky to be able to attend two camps and experience so many different things. He was glad to discover that he could survive without eating (much) meat. He appreciated his solid crew. He said, "Thanks to Will and Mike and Monik. Taking care of me every day is a lot of work. I loved the concert and singing with Bob Lehman. I love all of you guys - camp is special to me." Rebecca said, "I am happy. I enjoy camp, and to the pillows, I say 'bum, bum, bum.'" Candy said, "I liked the concert, the beach, seeing the fish and I'll see you next year." Monik said, "I want to thank you all for how fun it was to teach music here. I got to know a lot of people this year because I bounced around a lot. I enjoyed doing the play and the concert. I'm so proud of all of us! Thanks!" Billy started his goodbye by replaying all his lines from the play, which were programmed into the Minspeak. Then he used the Minspeak to tell us that he really loved the Boston Pops and the play! Gabe thanked Peter and Steve for the time they all spent together. "It's really tough to go back to reality - we're all feeling that. I love you and hope to see you next year!" Jamie thanked all the ladies in the suite. She said getting everyone to bed was really difficult, but, "I loved it; I'll be thinking about camp all year and can't wait for next year." Rachel said, "I love you guys so much and everyone's worked so hard. It's a beautiful group, you've been so patient and kind and wonderful. Thank you!" Bob said, "Abuya, acha, abu. Yeah!" Then he brought Will up to the front with him and sang a good-bye blessing. Talia said, "Thank you for another incredible summer. I had a lot of doubts because of our numbers. I'm just so impressed with everyone. I want to say a huge thank you to Bob and Cameron, and to Peanut - - you've had your best summer ever!" Best John said, "This is my second summer spending a little time here - there is a magic here. It's a wonderful family. You are so wonderful and gracious and I commend you all." Cameron came up with Talia and communicated with a few sounds that Talia said meant he loves us and will miss us. Talia said Cameron had a great year at camp and a great day today - he loved getting kicked out of yoga for making too much noise. Joan came and ate dinner with us and said, "I am struck by how beautiful all the people are here. I am so lucky to get to be here. It's the best and most beautiful thing that happens in the course of the year. Jackie said that he liked seeing Gabe and Emily get married again. He said the more he comes to camp, the more Gabe feels like his brother. He thanked Gillian and reminded her that next year he would like to visit Martha's Vineyard again. Gillian said, "This year our numbers were unusual, so things were more like the old times, but people worked together in a wonderful way! I did doubt that the play would work out, but it did - - and one thing's for sure, I never doubted these guys. They can do anything. They learned the words to "Hair" -- as I knew they would!" Ellen and Mike talked about throwing rocks into the water at the beach and how much she enjoyed the crash and "bonk" noises they made as they entered the water. Ellen said she loved camp and wants to come back next year! Mike said, "Thank you so much for working so hard - everyone was really amazing! I genuinely love spending time with you; it's a treat and a blessing. It was a hard year, and to get through it, we all had to be our best. AJ, I had a great time with you! Thanks for showing up, being present and being positive!" Eleanor said, "Sometimes I think I should retire and just stay home and make pots and read books, but then I think about all the fun times I have here, and all the new things I learn here and I think I might have to come back next year, just to keep having a great time with you!" On that note, we had a five-song dance party, packed and went to bed. The last day. No one's favorite. After so many days of blue skies, it poured in the early morning hours, so we sloshed through puddles as we loaded the vans. No one's ever very hungry for breakfast on the last morning, so there was soggy cereal left in bowls, and many of our faces looked more than a bit soggy, too. Tulgey Wood 2016 has been a remarkable, memorable and wonderful year! There are so many people to thank for their generosity and open arms! We will accumulate their names and add them to this blog, but for now, we all have a lot to do to take down all the bunk beds, pack up our belongings for storage, and clear out of here within 24 hours. Rather than risk an incomplete list, we'll just send out a huge cheer and thank you - but more will follow! P.S. In our last evening meeting, we discussed the fact that we have accomplished a lot in our first ten years, but we greatly need additional help in order to carry on. If you are someone who would like to contribute organizationally (or financially, of course!) please let us know. Big issues such as improving our transportation (we have an ancient van which received a terrible prognosis from our mechanic and we always have to scramble to have enough additional cars and trucks to use), help with organizing activities, help with fundraising, cooking, recruiting more volunteers to join us and to offer support to our friends with disabilities, help setting up and closing down, and here's a biggie! - help with finding a permanent accessible home are at least some of what we need to be thinking about. We'd love to hear from you, and we invite you to share this blog with others who might want to jump in!